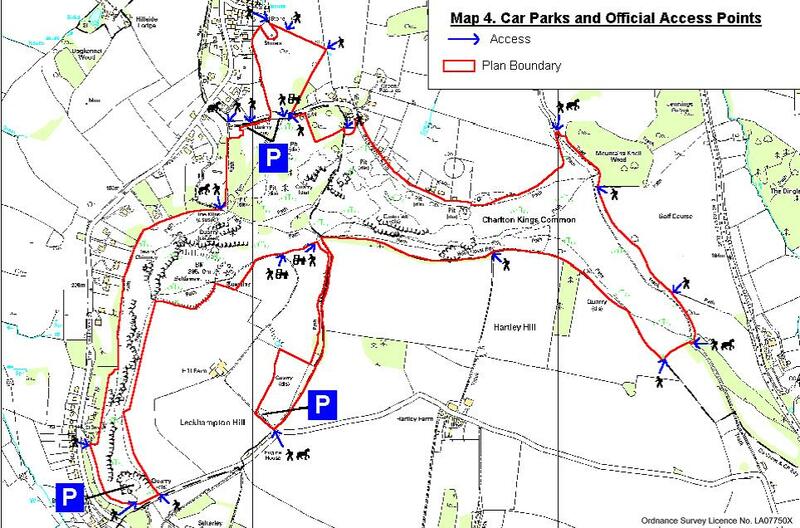 Leckhampton Hill and Charlton Kings Common can be accessed by road or footpaths as shown on this map. There are two car parks on Daisy Bank Road, one just past Tramway Cottage known as Daisy Bank Car Park and a second further along called ‘Bridge Car Park’. There are two further car parks at higher levels and accessed from the eastern end of Hartley Lane – the first in Salterley Quarry and the second at Brownstones Quarry Car Park. 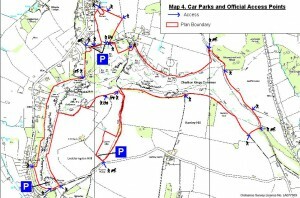 There are a number of footpaths that can be used to access the site and the access points from these are also indicated on the above map. Leckhampton Hill and Charlton Kings Common are Registered Common Land and the public are free to roam over the full area. There are a number of formal public footpaths and bridleways on the Hill and Common, as shown on this map. This includes part of the Cotswold Way which is a National Trail. There are also a number of other informal tracks that criss-cross the Hill and Common which the public also regularly use. In September 1927, when Cheltenham Town Council were purchasing Leckhampton Hill, the mayor, Alderman C H Margett, made an address to the Town Council stating “We shall acquire not only property but we shall maintain for the public the right to roam over Leckhampton Hill. We shall be handing to posterity a large open space which can be visited by any and every inhabitant of this town”.